Big news in our community: The Jain Center of Southern California (JSSC) has decided to serve all vegan meals starting next year, with a transition period this year. Pravin uncle of the JAINA Education Committee gives us the inside story here . As nicely described by Sagar of Young Jains here, the JSSC is the third Jain organization, after the Sri Digambar Jain Association in 2016 and Young Jains UK in 2017 to go vegan. This is the first one in North America to go vegan. Fellow Jains have called on Northern California, Houston, Chicago and others to follow. Let’s hope they do. And with the JSSC hosting the next JAINA convention, we can hope that the biennial convention of North American Jains just might make a bold step that’s been a long time coming. We Jains have a deep caring for all living beings and it’s an easy argument to eliminate dairy because we are saving the lives of dairy cows and their calves, egg laying hens and their chicks. If we reflect on Earth Day, and the myriad ways that farming animals contributes to climate change, pollutes the water and air, uses inordinate amounts of water and land, we can see the less direct but still important benefits of going vegan. Books like Drawdown list plant rich diets as #4 in the list of most impactful steps to save the planet and all the living beings on it. Not only does the dairy industry cause immense pain to the tortured animals like cows and chickens, but it also leads to a large amount of water consumption, land degradation, climate alterations, and gas emissions. While it only takes one acre of land to produce 40,000 lbs of cherries, potatoes, and other fruits and veggies, one acre of land can only produce 250 lbs of beef. At the same time, there is more land necessary to maintains animals rather than planting fruits and vegetables. 70% of water is used on farming and of that, the water that is used to clean waste is dumped into the ocean which pollutes the water and kills many sea creatures. From a Jain standpoint, the cows and chickens which produce milk or eggs receive horrible treatment and are forced to live in confined areas where they can’t even move. Most of the time these animals are beaten by the farmers and the cows are continuously kept pregnant to maintain milk production. The calves are then sent to slaughter houses. While many Indians may question the health aspect of becoming a vegan, it is proven that dairy products are not necessary for the survival of a human after the stage of a baby. There are many alternatives to dairy such as soy and almond milk, soy cheese, and various other products from whole foods or central market. By converting to veganism, you would be saving the environment as well as shedding the karma that each soul acquires by encouraging the dairy industry. Methane is an odorless and colorless gas made by anaerobic bacteria on land and deep in the ocean. It is the 2nd most abundant greenhouse gas in the atmosphere second to CO2. Natural gas and petroleum systems are the largest source of CH4 emissions from industry in the United States. Domestic livestock such as cattle, sheep, and goats produce large amounts of CH4 as part of their normal digestive process. Methane is generated in landfills as waste decomposes and in the treatment of wastewater. Upgrading the equipment used to produce, store, and transport oil and gas can reduce many of the leaks that contribute to CH4 emissions. Methane can be reduced and captured by altering manure management strategies at livestock operations or animal feeding practices. Not eating foods that promote this industry to grow will also help. Emission controls that capture landfill CH4 are an effective reduction strategy. Also, reducing the amount of waste that you produce can decrease the size of landfills over the years. Even though 75% of the earth’s surface is covered in water, only 2.5% of it is fresh and 2/3 of that it frozen. This makes water an extremely precious resource, something that many people fail to understand. A huge number of large rivers including the Colorado, Rio Grande, Ganges, and Nile are no so over tapped by humans that they discharge little to no water into the sea for months. In addition globally our water use has been growing at twice the rate of population growth in the last century and here in the United States, twice the global average is used. Over tapping also causes countless freshwater species to die and they are becoming extinct at twice the rate of saltwater species. Clearly, over using water is a huge crisis and measures must be taken in order conserve water. Vegetarianism is actually very beneficial in conserving water; livestock accounts for more than half of all the water consumed in the United States. 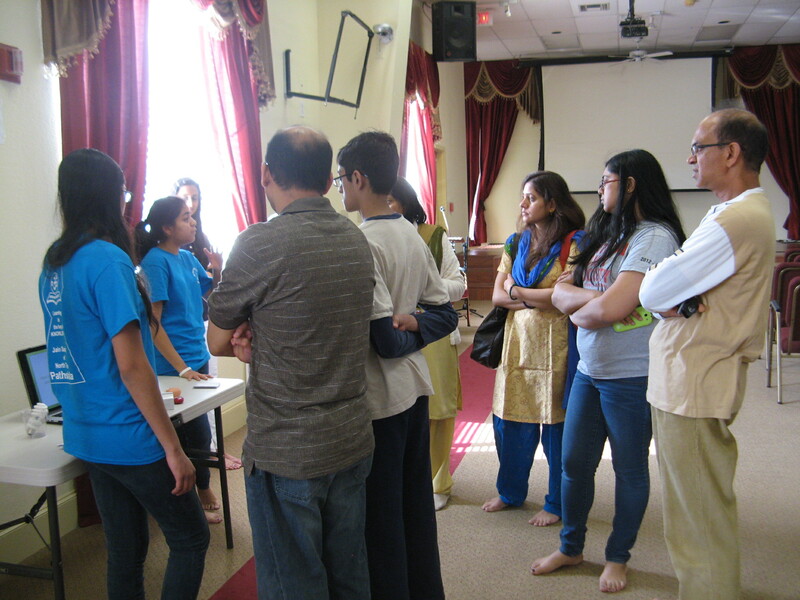 The Jain Society of North Texas’ (JSNT) high school age youth (Pathshala Group 6), with the help of Joseph R. Otterbine,an M.S. Applied Environmental Anthropology Candidate from the University of North Texas, recently held the JSNT Environmental Fair. The Fair brought a Jain lens to bear on energy and electricity, veganism, transportation, water usage, and methane production. The youth decided on these topics and researched them thoroughly. 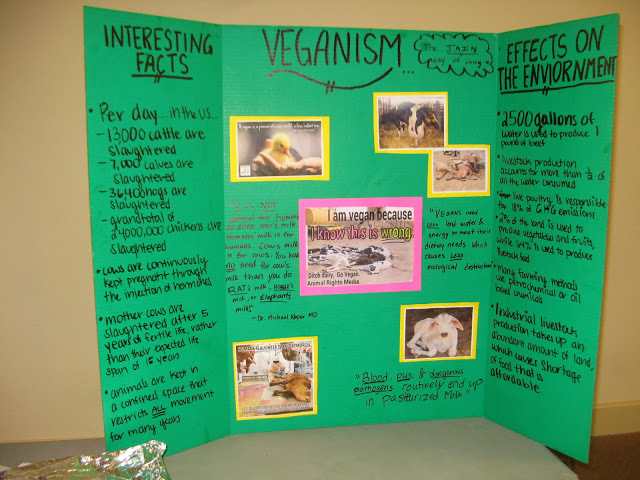 They split into five groups and prepared presentations, visuals, and takeaways (e.g. vegan brownies [yummy!] , pamphlets, fact sheets, water usage calculator, etc.) for their booths at the fair. The Fair started with time for the community to walk around and see the booths, followed by a presentation from Dr. Pankaj Jain (University of North Texas) on the topic of Dharma and Ecology. youth’s efforts and proud of all the work that they had done in putting together all the intricacies of the Fair. When it came to the scheduled end of the Fair, some community membewer asked for more time to explore all the work that the youth had done! This event was successful because the youth wanted to do it, and OWNED it! This enthusiasm was palpable in their presentations, their attitudes, and interactions with the community. 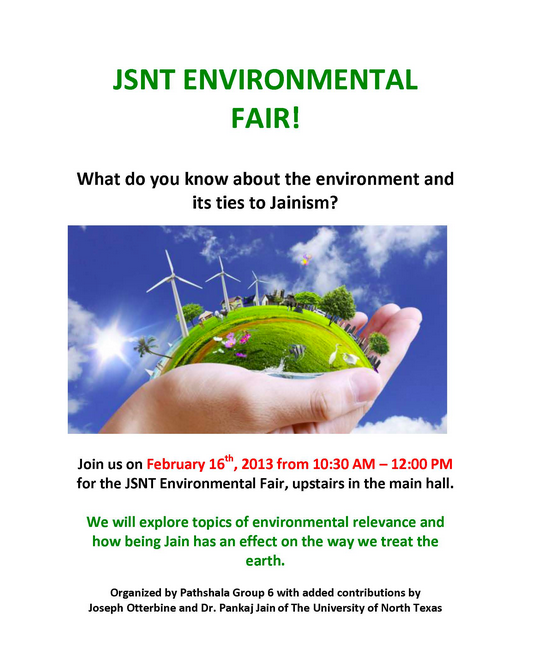 The Fair got the Jain Society of North Texas to look at environmental issues and how they, as Jains, are poised as natural environmentalists. In the late 1990s, the Jivdaya committee actively promoted veganism. It was clear that animal sanctuaries, the traditional institutions for Jains to give money in India to express their ahimsa, was not addressing the root of the problem of animal suffering and slaughter. I have posted some of the material from this era on this site. This year was have a newly approved JAINA committee to represent these views and link them with our growing awareness of environmental choices that we make that can hurt or help animals and other living beings. Dubbed the Ahimsak Eco-Vegan Committee, our objective and goals follow. The Ahimsak Eco- Vegan committee, as an expression of ahimsa, support veganism which we understand to mean not eating, wearing, or using animal products, because we object to both animal suffering and animal killing. We do not support animal use that is supposedly “humane” and we do not support the marketing of animal products labeled as “humane”. The Ahimsak Eco- Vegan committee, as an expression of ahimsa, supports the reduction and elimination of activities contributing to harm of all life, global climate change and destruction of the planet. Provide health related education to the community on a plant based diet and conduct research benefitting our community and contributing to scientific knowledge on benefits, risks and risk mitigation of the modern vegetarian and vegan diet as consumed by Jains in North America. Based on the combined work of 15 Jain Center of Greater Boston volunteers and his own personal stories, Sanjay provides a compelling case for Jains to become vegan as the true expression of vegetarianism based on ahimsa. Sudhanshu and Sanjay gave two excellent powerpoint presentations at JCNC this weekend as part of the 13th Anniversary celebrations.